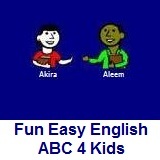 ﻿ Fun Easy English - new writing english alphabet for kids letter y. Hey kids, try writing the letter Y. Playing with a yoyo is fun. Yogurt comes in many different flavors. Cats like to play with a ball of yarn.